If you run a business that bills for its time, Sage Timeslips is the key to tracking your time and increasing profitability. Learn to work more efficiently in Sage Timeslips by touring the Slip Entry window, mastering a few keyboard shortcuts, and becoming familiar with the Sage Timeslips toolbar. Sage Timeslips refers to time and expense entries as slips. 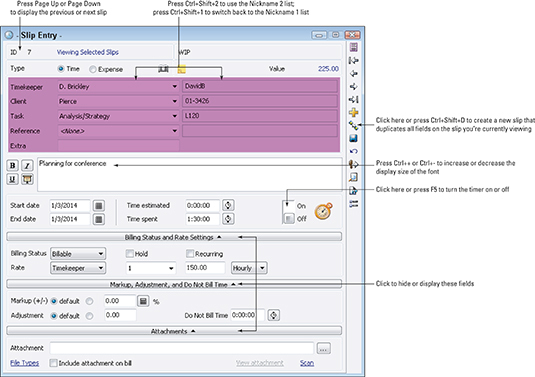 Use the following figure and tips to speed up working in the Slip Entry window. In the shortcuts listed, the case of a character (uppercase or lowercase) doesn’t matter. For example, in a date field, you can type T or t to enter today’s date. Press the Tab key to move from field to field; press Shift+Tab to move backwards one field at a time. Tab into any Nickname field and type a few characters of the nickname you want to use. Timeslips matches your typing to existing nicknames and selects the closest match. When you use a keyboard shortcut to switch between nickname lists, use the numbers above the keyboard letters, not the numbers on the number pad. In the Description field, press Ctrl+A to select the entire field. Select a word or phrase and press Ctrl+B, Ctrl+I, or Ctrl+U to apply boldface, italics or underlining, respectively. Press Ctrl+F7 to open the Abbreviations list. Press F4 to check the spelling of a word or Shift+F4 to check the spelling of the entire field. In the Date fields, press T to enter today’s date, S to enter the same date as the one that appears in the other date field, + (plus) to increment the date, − (minus) to decrement the date, or C to display the Date Range dialog box. Repeatedly pressing the + or − key increments or decrements the date. In the Time fields, type the time in decimal format (for example, 1.25), and Timeslips converts the date to hours, minutes, and seconds. To type in time format, type hours, minutes, and seconds using two digits separated with a colon (:). Right-click any field to see a context menu of commands appropriate for that field. Press Ctrl+Shift+C to duplicate the current field using the information on the last slip you viewed. Press Ctrl+Shift+E to duplicate the rest of the fields on the current slip using the information on the last slip you viewed. Press Ctrl+N to start a new slip. The toolbar appears at the top of the Sage Timeslips window, just below the menus, unless you hide the toolbar using the Personal Preferences dialog box. The pictures on some buttons don’t truly suggest the button’s purpose, so here’s some help for you. And if you don’t want to use the toolbar, choose Setup→Preferences and click Menus and Commands on the left. Then deselect the Show the Main Window Toolbar check box.